The world today is awash with data. We live in the age of Big Data, with many of our devices collecting and storing data about our habits, locations, shopping choices and our health. Where is all this data stored? Who controls it? And what will happen when all this data, which is now fragmented across companies and government agencies, is aggregated? Should we be concerned about how will this concentrated data of ourselves be used? 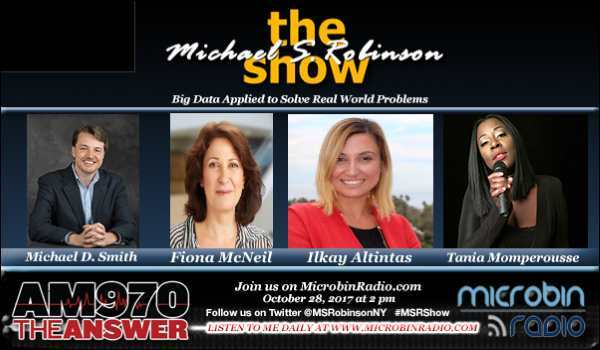 Michael Robinson delves into the future of big data with his guests: Michael D. Smith, Fiona McNeill and Dr. Ilkay Altintas. He closes with musical guest Tania Momperousse. Copyright © 2019 Microbin Radio. Powered by WordPress. Theme: Spacious by ThemeGrill.